Fish & Chips at Terrigal Beach, Australia. Yesterday, I stopped off at Terrigal Beach on my way home from an appointment. Terrigal is only about a 30 minute drive away and an hour North of Sydney. Yet, it’s been over a year since I was there last.While we live right near a beach ourselves, Terrigal has its own attractions and I can’t believe we don’t get there more often. Indeed, yesterday was something of a wake up call. An urgent reminder to carpe diem – seize the day. No doubt, you also know how it is. That it doesn’t matter how close you are to paradise, it somehow passes you by. Not necessarily through any active thought on your part, but more likely through busyness and procrastination, although there’s also plenty of scope for full-scale avoidance. Indeed, at the moment, even sticking my head out the back door only an arm’s length away, has slumped into Mission Impossible. Not that I’m depressed, anxious or phobic in anyway. For some reason, I just don’t quite seem able to make it. That is, despite holding Carpe Diem – Seize the day as my personal mantra. So, I am proud of myself for not only indulging in Fish & Chips from the self-professed “best fish & chips in NSW” (well, there must’ve been some award), but also taking myself for a walk. Getting EXERCISE!!! Indeed, along with all my other doings, I actually managed to clock up a respectable 3,629 steps or 2.4km. Way better than Monday’s 132 steps (must’ve left the phone at home) Or, today’s unimpressive 70 (Yes, I know it’s almost 1.30pm, but I’m still trying to get the motor started). Looking across to the Fisherman’s Co-op where we used to buy leather jackets when I was a kid. Anyway, let’s just ignore the bigger picture for a tad, and just focus on yesterday. For anyone who even vaguely knows me, you won’t be surprised that I had my camera with me. That, also explains why I walked the extra mile. You see, when I’m looking through the lens, I have no idea how far I’ve walked, where I am or even if I’m currently in grave danger. All I see is the shot. Indeed, even if it isn’t a biggy, I’m still seeing and thinking in 6 x 4 and the rest of the world does not exist. Terrigal was first settled by Europeans in 1826. John Gray, who was the first European settler to the area, called his property Tarrygal, after the indigenous Aboriginal place name, signifying ‘place of little birds’. Terrigal Beach in the 1970s looking South towards the Skillion. As a child, our family used to rent a place in Terrigal or nearby Wamberal during the Christmas Summer holidays, when it was a much humbler version of the tourist resort you see today. Indeed, in so many ways, I wish they’d left it alone but there are always those determined to convert a place with such natural beauty into a monument to man. As I said, I’m pleased that I managed to take this time out to bask in our local environment and although I’m feeling rather inert today, I am feeling the need to get the motor fired up again. The sun is shining. 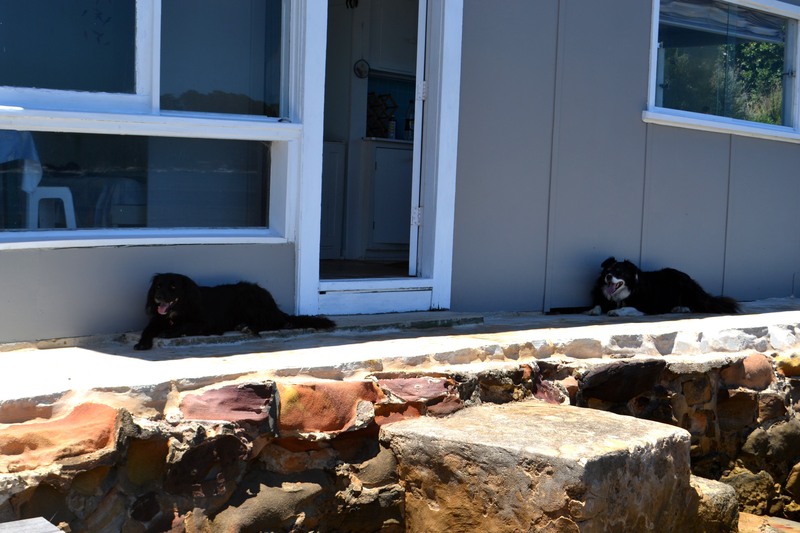 The dogs would be begging for a walk if they weren’t so busy sunning themselves while I’m tapping away indoors like a moron. What’s wrong with me? Why aren’t I out there? Especially, when I am so adept at avoiding the To-Do List which, at least in theory, is what’s keeping me here? Indeed, I am so close to being outside, that I could almost fall out of my chair into the sunshine. Zack’s no idiot. He’s not inside on a sunny day. He’s out on his Pooh Bear blanket sunny side up. Well, to be fair, I have actually been making calls and waiting for replies while I’ve been tapping away here. As most of you will agree, getting even the most simplest thing done, takes multiple steps each with its inevitable snags. Indeed, I’m perfectly justified for feeling psychologically and physically stonkered (to use one of my Dad’s pet words). Anyway, before the day completely goes up in smoke, it’s time I disappeared outside and found the sun. Have you done something similar lately and made the most of where you live? This entry was posted in Australia, Parenting, Photography, Travel and tagged Australia, birds, carpe diem, fish & chips, lunch, NSW, paradise, photography, sea gulls, Terrigal, travel on July 25, 2018 by Rowena. Utterly beautiful, I was quite mesmerized by these fluffy clouds scudding above the Hawkesbury River on Sydney’s Northern fringe. A fabulous way to spend Fathers’ Day 2016. This entry was posted in Australia, Photography, Sydney Postcards, Travel and tagged art, Central Coast Cruises, clouds, cruise, Hawkesbury River, mindfulness, NSW, photography, relaxation, river, rivers on September 5, 2016 by Rowena. Palm Beach Perspectives, Sydney, Australia. Known as Summer Bay to lovers of the TV Drama series Home & Away and “Palmy” to those in the know, generation after generation have made the long drive up to Palm Beach often returning with sand-encrusted butts, sunburn and shocking tempers in a stinking hot car full of flies. Of course, that’s turning the clock back to the inimitable 70s when going to Palm Beach for us, meant piling into the family’s beloved HG Holden which had painfully hot upholstery and no air-conditioning. Ouch! 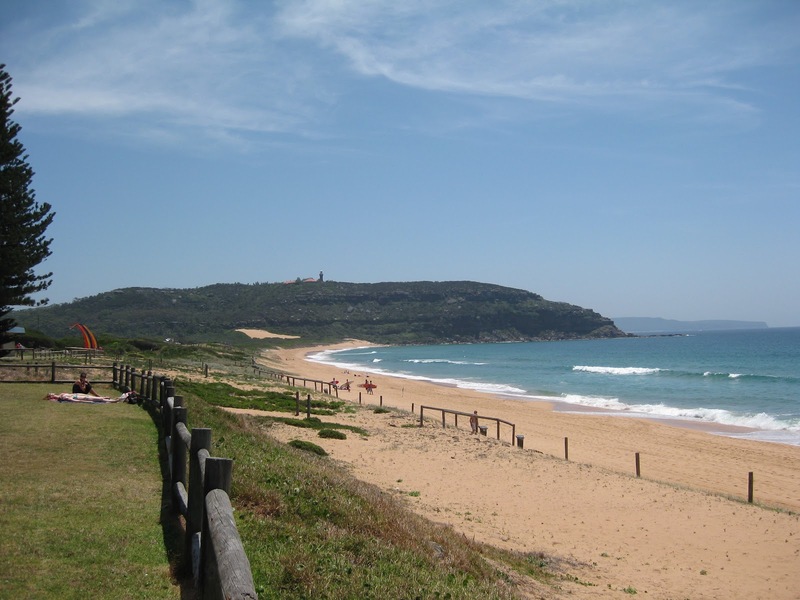 Palm Beach is located 41 kilometres North of Sydney’s CBD. However, I can assure you that if you’re catching the legendary L90 bus, welcome to eternity. Indeed, the journey takes around 2 hours. If you were traveling in Europe, you could well have traversed a few countries in that time. Moreover, bus is the only form of public transport. At least historically speaking, trains have been resisted. On the other hand, if you are coming from the Central Coast, Palm Beach is only a stone’s throw away. You can catch the Palm Beach Ferry from either Ettalong or Wagstaff, which is an absolutely stunning 30 minute trip. When that gorgeous Australian sun is illuminating the ocean like a magical diamond carpet and the wind isn’t too strong, you’re in absolute paradise. On the other hand, when there’s heavy rain, strong winds, the ferry is heaving up and down through what feels like treacherous surf and you’re about to throw up; you feel like you deserve a bravery award once you reach the other side. Yes, at times like that, you even wonder if you’re about to become a modern version of the Swiss Family Robinson or remake Gilligan’s Island. Melodrama aside, the crew are very adept and the ferry is cancelled during particularly rough weather. Palm Beach is an absolute kaleidoscope of perspectives, like any place, once you scratch beneath the surface. Obviously, creating that sort of mosaic, isn’t possible here so I’ll stick to the bigger picture, providing more of a broad-sweeping overview which a few “local” insights. Geographically-speaking, Palm Beach has two quite opposite perspectives: the surf beach and Pittwater. The beach equals waves and swimming while Pittwater is “flat” and better suited for sailing, kayaking and other water sports. Starting off with the surf beach, the first thing you’ll probably notice is that the sand is deep gold in colour. The next thing, is the surf. At the Southern end, the waves are relatively gentle and you have “kiddies’ corner” where families with young kids hang out. There’s also an ocean pool where you can swim laps. The beach then stretches around towards the Northern end with it’s famous surfing breaks and culminates with the Palm Beach Lighthouse, which lies perched on top of the headland like a crown. If you are fit and energetic, you can walk up to the Lighthouse. I haven’t been up there for years and I’ve heard the path has improved but it used to be more of a climb than a walk. The majority of swimmers are clustered “in between the flags”. The red and yellow flags mark where it’s safest to swim and is patrolled by the Surf Lifesavers. So, if you find yourself getting into difficulty, you can easily be spotted and rescued. I can assure you that as a teenager, my friends and I did consider needing a bit of CPR but never actually implemented these plans. We were all “talk”. That is, except when it came to talking to the lifesavers. These Adonises were in a league all of their own. In a scene reminiscent of hundreds and thousands sprinkled on top of bread and butter (fairy bread),the crowds pour into Palmy from Christmas through to the Australia Day weekend at the end of January, which signals the return to school and the end of the precious Summer holidays. Then, the masses jostle for a precious rectangle of sand to park their towel on the hot,hot sand under the scorchingly hot Australian sun. Although people living overseas have asked me about the hole in the ozone over Australia, it doesn’t look like all the sunbakers roasting themselves into early-onset melanoma have heard anything about it. When we were young, we used to to cover ourselves in baby oil or get sprayed on the beach by coconut oil, which was the height of sophistication back in the 70s and 80s. There was no such thing as a “fake tan” back then. Just sunburn, peeling skin, freckles and the odd genetic mutant who could actually pull off a tan. Many years ago now, I used to hang out on the beach where designer sunnies were de rigeur and it certainly wasn’t the sort of place you’d turn up with hairy legs and arm pits which could fuel a forest fire. You didn’t just practice “the strut” at Palmy either. You had to have that down pat beforehand so Palm Beach could be your catwalk. Even better, if you also had the fingernails to eliminate your competition! 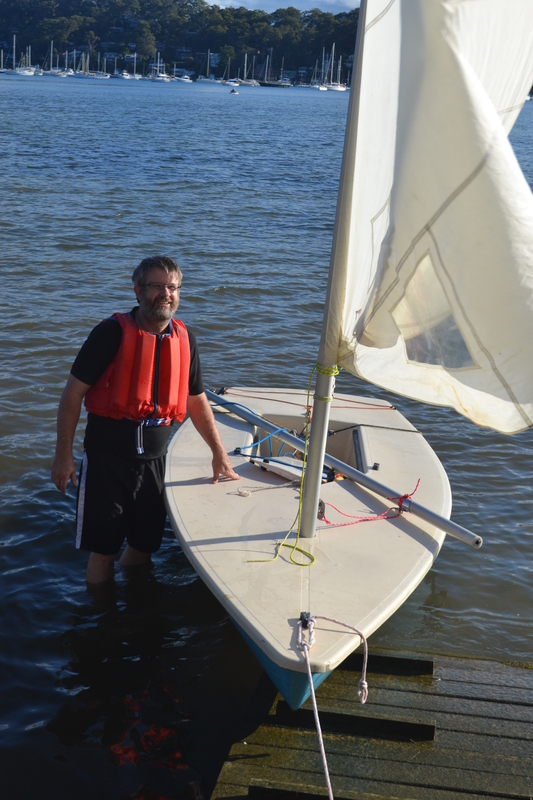 Geoff arriving home from a sail. While the beachfront is renowned for flashing incredible wealth in a subtle, understated way and very much being “a scene”, the Pittwater side of Palm Beach is like it’s alter ego and incredibly down to earth Understandably, there generally isn’t that fashion element you get over at the surf beach. Getting covered in sand and mud, we save our good clothes for back home or dining out and only wear our glad rags out there. It’s water shoes, wet suits, swimmers, grungy t-shirts and thick smears of sunscreen and broad-brimmed hats. Although my tour of Palm Beach is rapidly drawing to a close, there are still two places I’d like you to visit. 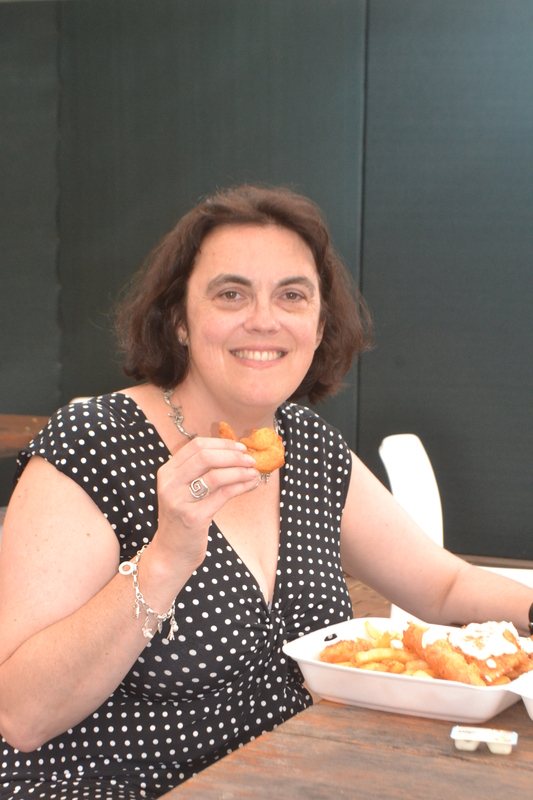 Here I am enjoying a deep-fried prawn from the Fisherman’s Basket. Firstly, there’s the infamous Palm Beach fish and chips shop, which has gone by various names over the years. 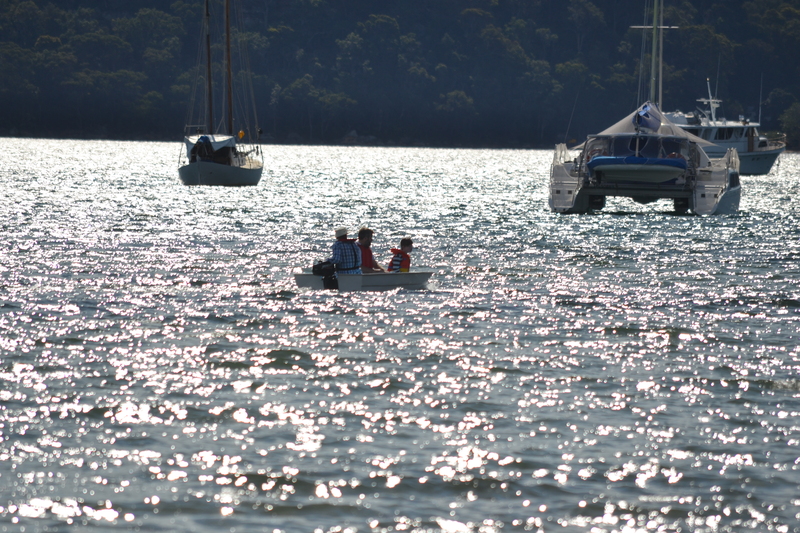 It’s located on the Pittwater side, just across from the ferry wharf. People come from all around Sydney and the Central Coast to feast on these fish and chips, which surely must be among Sydney’s best?!! You can either eat-in or take them across the road and eat them in the park while checking out the sailing. Secondly, there’s Alf’s Bait Shop in “Summer Bay”. Personally, there’s such an incredible cringe factor and like Neighbours, Home & Away is best exported but the show has been a fabulous ambassador and no doubt sold Australia to thousands of tourists. Palm Beach really does look incredible. That said, they usually present a glamorized, postcard perspective. After all, it does rain in Palm Beach and it isn’t always sun and blue skies! However, while so far I’ve given you what pretty much reads as the glamour tour of Palm Beach, I can’t help feeling that Palm Beach is a little over-rated, especially given the cost of real estate. Even though it is part of Sydney, Palm Beach is actually very isolated and lacks most of what I would class “essential services”. There are no proper supermarkets and you have a ten minute drive into Avalon, which can extend to 20 in traffic. It is impossible to find a parking spot, which has meant that we’ve gone down for fish and chips and have driven off. I don’t want to knock down paradise and put up a parking lot. However, you do need to eat and get out of the house. That is also made difficult by the very narrow, twisting roads which lack adequate footpaths/ Indeed, in spots being a pedestrian is almost asking to get run over. As I was walking back from the bus stop the other day, I really felt like I needed to breathe in to distance myself from passing traffic. Consequently, you can feel a little trapped and claustrophobic on the “insular peninsula”…especially when we have stunning beaches back home which are close to the shops, train and bus at such a fraction of the cost of real estate here. Actually, thinking about Palm Beach’s location, it’s almost like someone was playing pin-the-tail on the donkey and stuck the pin almost off the side of the map. Even though it’s located in Sydney and not in the outback, it does feel strangely isolated both from services and people. So many of the houses are empty. I am a bit down on Palm Beach at the moment because my Dad has sold the house here and we’re moving on, which is a serious wrench. So rather than writing home about all the things I love about the place, I am also trying to remind myself of all the other equally beautiful places elsewhere and think about the flip side of the travel experience. For the last few years, we’ve immersed ourselves here but perhaps now it’s time to explore further afield and explore with a broader brush. When it comes to the Pittwater side of Palm Beach,it feels like we’ve explored each and every single hair on its head…especially when I’ve photographed it in such incredibly, minute detail and it feels like I know each single hair on its head, even though we’re still finding new critters. So, soon I will be seeing our time in Palm Beach from another perspective…the past. I don’t need to leave it behind completely. After all, it’s only a short 30 minute ferry ride away but we planted roots here even if they’re uprooted and not severed completely, it still hurts and I feel a bit lost and disorientated. That said, once school goes back next week and we’re back to the grind at home, it will be a different story. This has been P for Palm Beach Perspectives for the Blogging from A-Z April Challenge. How are you going with the challenge? Thank goodness, it is Sunday tomorrow and we have a break! This entry was posted in Australia, Blogging From A-Z April Challenge, Sydney Postcards, Travel and tagged A-Z Challenge, adventure, Aussie, Australia, Australian, Avalon, beach, Change, family, fashion, grief, growth, Hom and Away, home, journey, kayak, Life Savers, loss, mom, mum, NSW, Oz, Palm Beach, Palm Beach Lighthouse, parenting, Pittwater, sailing, school holidays, summer, Summer Bay, sunbaking, sunburn, Surf Lifesaving, surfing, Sydney, tan, travel, TV drama, yacht on April 18, 2015 by Rowena. My Dog Post: Lady at Palm Beach, Sydney. Welcome to Summer in Palm Beach, Sydney on Australia’s East Coast. Of course, this means that if you’re visiting us from frozen lands across the globe, you’ll need to turn up the heat…a lot!! It’s incredibly hot here and we’re all fighting for a bit of shade. Indeed, a little bit of snow and ice would be most welcome over here!! I’m such a picture of innocence. Perhaps, I shouldn’t have brought these damaging posts back up. Some things are best left buried in the past and never dug up. However, the photos are good and as for the words….I assure you, it’s all lies. Mum has an overactive imagination and a real gift for hyperbole. That might be good for her writing but it hasn’t helped my reputation. You see, after all of her tales, I’ve actually acquired something of a reputation for being:”wild”, “mischievous” and an all-round “bad dog”. I wasn’t impressed at this complete lack of respect. After all, I was just a dog being a dog….nothing more, nothing less. Now, other mums and dads pull their dogs away whenever they try to say hello. I’ve been deemed a “bad influence”. After all of that dreadful publicity, I seriously considered suing Mum and terminating her blog. However, if there’s one thing you soon learn as a pup, it’s not to bite the hand that feeds you…especially when bacon fat, BBQ chook and juicy bones are at stake. It’s all part of a dog’s modus operandi to encourage good relations with the family cook..even if that does involve suffering a few indignities on the world wide web. Anyway, Mum and Dad are serious disciplinarians. So instead of clearing the road of dead rabbits, I’m on a strict diet of tennis balls. These might thrill Bilbo and turn the usually comatose mutt into some sort of Olympic champion, but personally I still can’t see the point. Tennis balls taste nothing like rabbit! Yuck! So here I am writing my first post on Mum’s blog. Once again, she’s off having a nap and I’m getting up to mischief… business as usual. I thought it was about time I had my turn and shared a few thoughts of my own. You’ll have to forgive my elementary efforts at applying my paws to this a#@*# keyboard. However, where there’s a will, there’s a way…thank goodness for spell check. Now, even a computer-illiterate, uneducated scruffy mutt like me can connect with the world. Amazing!! That said, I’m much more adept at leaving messages on posts of a different sort and I can assure you, that they’ve attracted quite a lot of traffic. After all, I’m a very popular dog. At least, I was before Mum spoke. Although I only attract local traffic and 62 nationalities visited Mum’s blog last year, my stats blow hers right out of the water. I mean, if you want to talk about views, visitors, likes and followers, I’m the undisputed Queen. You might think that as a Lady, I might be getting ahead of myself but I beg to disagree. I’m hot and once I clear up all of Mum’s tattletales, I’ll be back to my old form. Unfortunately, Mum doesn’t always appreciate my popularity. She’s always in such a rush and just wants to keep walking. Raves on about me lowering her heart-rate. That it’s all my fault that she’s put on weight. She even threatens to leave me at home. But I’m simply a dog being a dog. That’s all. I can’t help it if I’ve had an enthusiastic response on my posts. Of course, all these messages are terribly exciting for a dog. It’s the canine equivalent to “you’ve got mail! 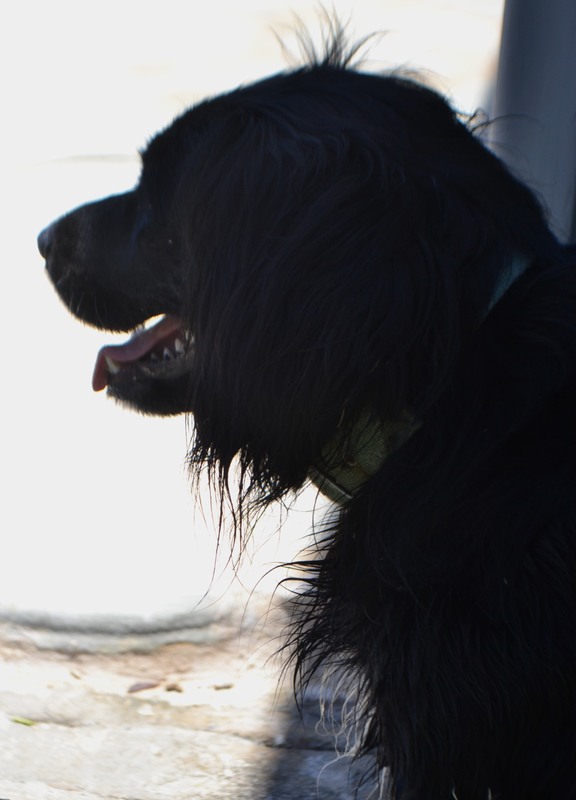 !” Being a deeply caring sort of dog and a good communicator, I just can’t give a stock standard reply to all my messages the way humans do. Oh no! Each and every message deserves a personal response and I must admit that I get quite thirsty after all that hard work. However, while Mum doesn’t like waiting for me, the same rules don’t apply to her. When she’s chatting, she forgets all about her heart rate and has no consideration for getting me back home in time for my morning rave at the postman. Oh no! She only stops when she’s ready to stop. If I so much as nudge on the lead, then I’m a “bad dog”. Where’s the fairness in that?I know she writes all about egalitarianism and the golden rule but does she put any of that talk into action? Not on your life. I wouldn’t believe a word of her precious philosophical theories. Besides, she gets most of her material from me and the rest of the family.She doesn’t make it up. Soon we’ll all be seeking royalties! Bilbo and I sheltering from the boiling summer sun in the shade of the boat house. We’re dreaming of a kennel conversion. . Anyway, aside from trying to rebuild my shattered reputation, I’ve also jumped online to tell you that we’re on holidays at Palm Beach for a few days. I’m told that Palm Beach is where they film the hit TV drama series, Home & Away, except we’re on the Pittwater side, which is better for sailing than surfing. I’ve been hard at work since we arrived investigating one of life’s perplexing mysteries. High Tide, Piitwater, Palm Beach on the way out to go sailing. For some strange reason, the water in our backyard keeps coming and going. One minute there’s water and slowly but surely it disappears and this whole new world opens up. I’m not talking about your ordinary puddle, which might just evaporate in the sun. This is a huge body of water….so much bigger than a puddle. Nothing, could drink up all that water. Moreover, that doesn’t explain how the water comes back…even when you factor in the waterworks Humph! I just don’t get it. Where does it all go? How does it come back? Moreover, what are those scuttling critters who tried to bite me on the nose when I dared to investigate? 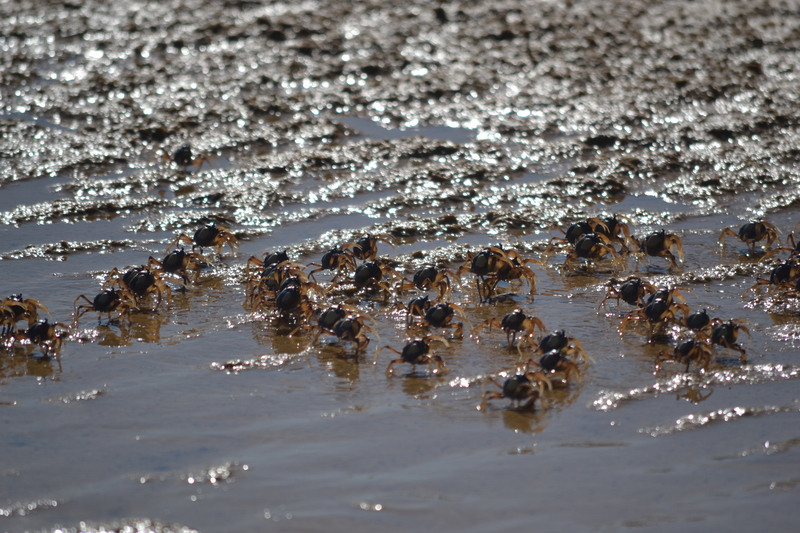 I was watching these critters this morning at low tide. There are so many mysteries in this world for a little dog. My head hurts! While we’re on the subject of mysteries, what happened to all the rabbits? I found one and as we all know, there’s no such thing as just one rabbit. Rabbits breed like rabbits. There has to be more but even I, the master rabbit hunter of the mighty Tenterfield Ranges, hasn’t been able to sniff them out. Humph! As I said, life is full of many, many mysteries! This entry was posted in Australia, Dog-Our dog Bilbo, Humour, Sydney Postcards, Travel, Uncategorized and tagged Australia, beach, beaches, blogging, Cavalier King Charles Spaniel, coast, dog, dog blog, dog blogs, dogs, environment, humour, Northern Beaches, NSW, Palm Beach, philosophy, photography, Pittwater, POrtrait of a Lady, psychology, sailing, Sydney, travel, walking, water on January 7, 2015 by Rowena.